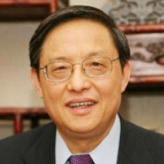 Zhou Wenzhong has served as China’s ambassador to the United States since April 14, 2005. Zhou was born in Jiangsu Province in August 1945. He began his diplomatic career in 1970 as a staff member ofthe Beijing Diplomatic Service Bureau for Diplomatic Missions. In 1973, Zhou left the bureau to attend school at Bath University and London School of Economics in the United Kingdom. He graduated in 1975 with an advanced degree and went to work for the Department of Translation and Interpretation in the Ministry of Foreign Affairs. Between 1978 and 1983, Zhou was attaché and then Third Secretary of China’s Embassy in the United States. In 1983, he served as the Second Secretary, Deputy Division Chief, and Division Chief of the Department of Translation and Interpretation in the Ministry of Foreign Affairs. He held these positions until 1987, when he became Deputy Consul General of the department. In 1990, Zhou left the Ministry of Foreign Affairs to become the Ambassador to Barbados and Antigua and Barbuda, serving until 1993. He then returned to the Ministry of Foreign Affairs, where he became Deputy Director General within the Department of North American and Oceanian Affairs. In 1994, Zhou became the Consul General of China in Los Angeles. From 1995 until 1998, he served as the Minister of the Chinese Embassy in the United States. In 2001 he served as the Assistant Minister of Foreign Affairs, and in 2003 he became the Vice Minister of Foreign Affairs.